As the land war in Europe goes on, the need to move troops and supplies by any means necessary became vital. At sea, carrier and resupply ships brave submarine attacks, underwater mines and aerial bombardment just to deliver the support their allies on land need. Below is a collection of photographs that somehow tells the story of the naval battles of the First World War, those caught up in it, and how much it affected the world. 1. 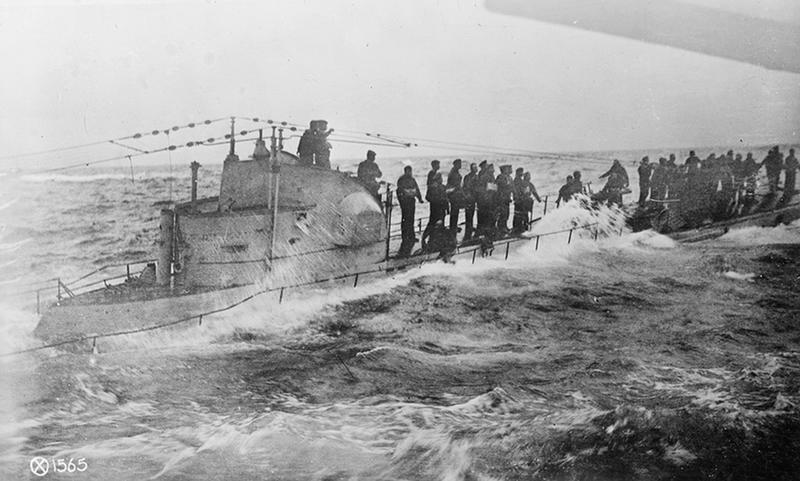 The former German submarine UB 148 at sea, after having been surrendered to the Allies on November 26 at Harwich, England. Later, when the U.S. Navy expressed an interest in acquiring several former U-boats to be used in conjunction with a Victory Bond drive, the UB-148 was one of the six boats allocated for that purpose. 2. 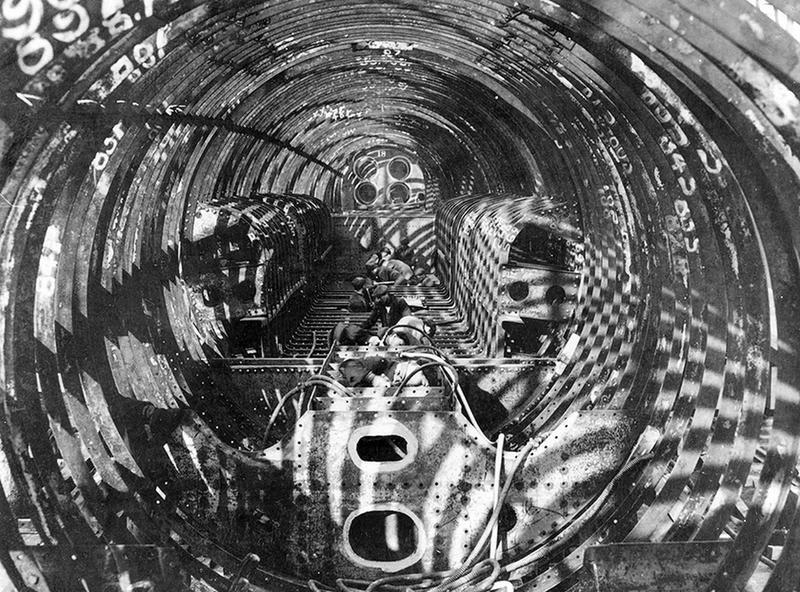 Interior view of a British Navy submarine under construction, Clyde and Newcastle. 3. Evacuation of Suvla Bay, Dardanelles, Gallipoli Peninsula, on January 1916. After eight bloody months, the Allied effort to capture the Ottoman capital of Constantinople (modern-day Istanbul) on the peninsula failed. 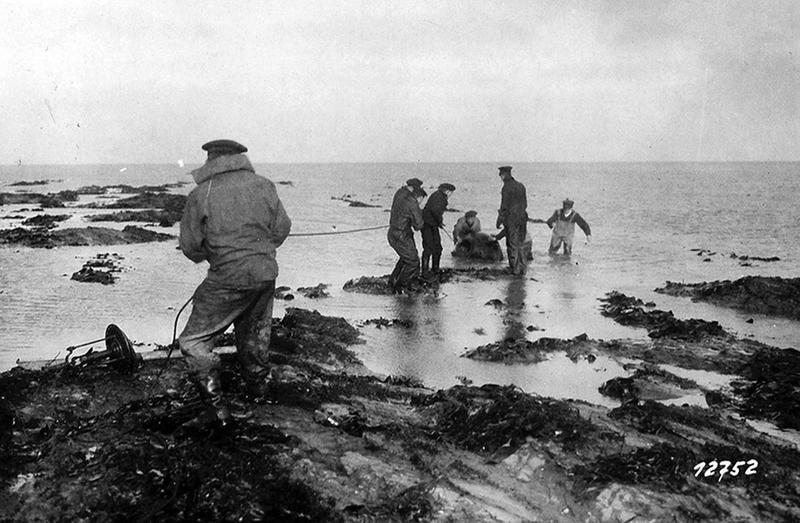 The troops withdrew in defeat, under cover of fire from the sea. 4. 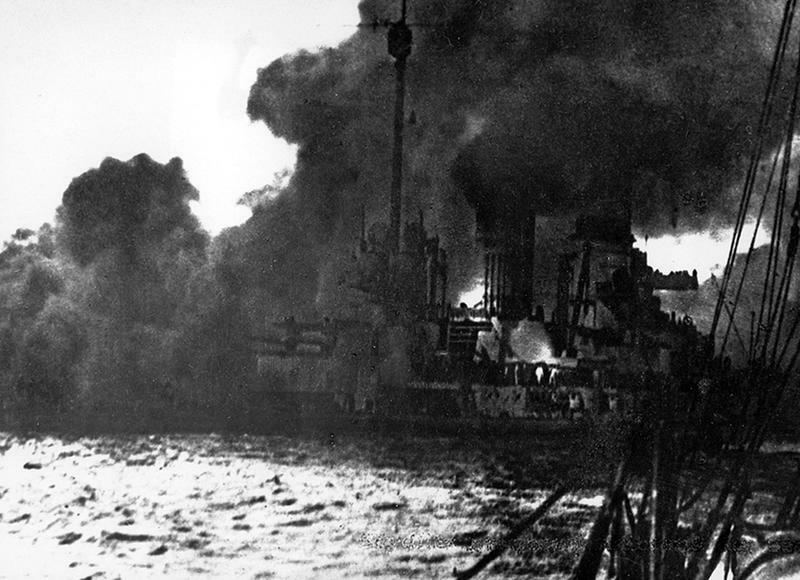 In the Dardanelles, the allied fleet bombed a disabled ship that interfered with navigation. 5. The British Aircraft Carrier HMS Argus which could carry 15-18 aircraft. The Argus didn't see any comabt as it was commissioned at the very end of WWI. 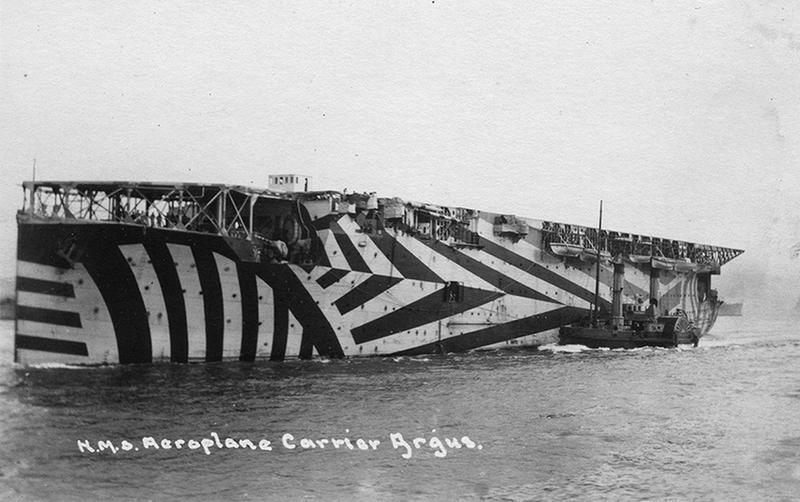 The ship's hull is painted in Dazzle camouflage designed to make it difficult for an enemy to estimate the range, heading, or speed of a ship, and make it a harder target - especially as seen from a submarine's periscope. 6. 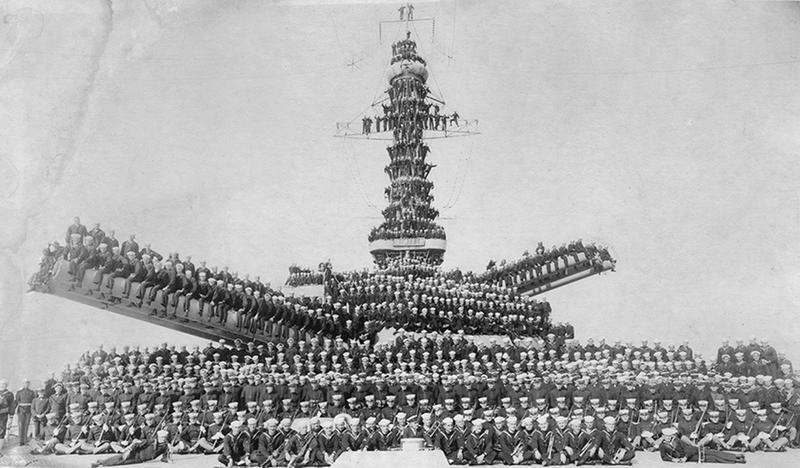 U.S. Marines and Sailors posing on unidentified ship, 1918. 7. 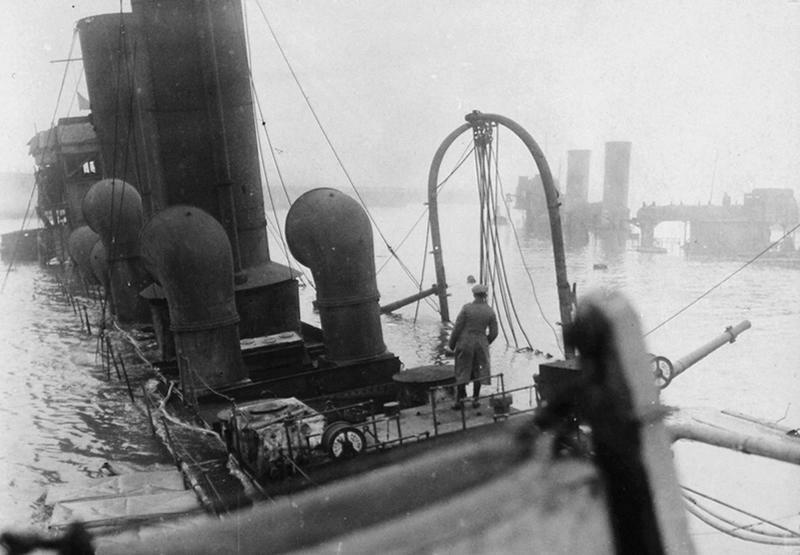 A mine is dragged ashore on Heligoland, in the North Sea, October 29, 1918. 8. A Curtiss Model AB-2 airplane catapulted off the deck of the USS North Carolina on July 12, 1916. 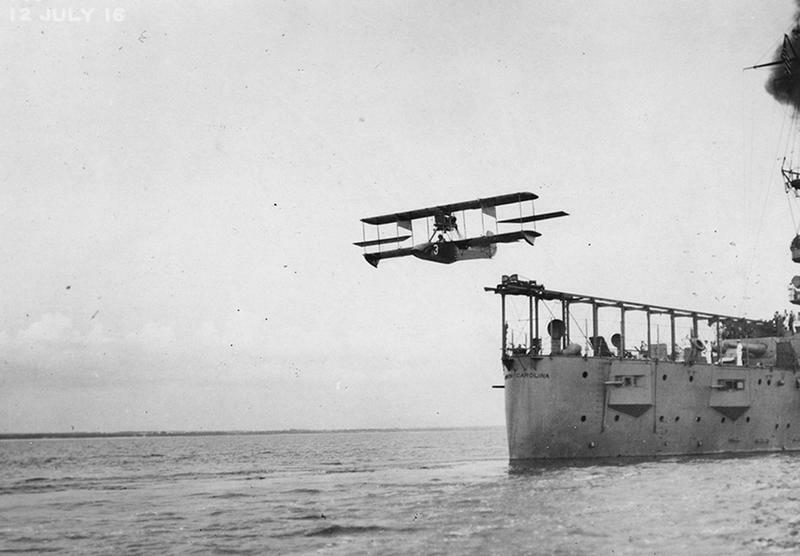 On November 5, 1915, the North Carolina pioneered the catapulting of aircraft from warships. 9. The USS Fulton (AS-1), an American submarine tender painted in Dazzle camouflage, in the Charleston South Carolina Navy Yard, November 1, 1918. 10. 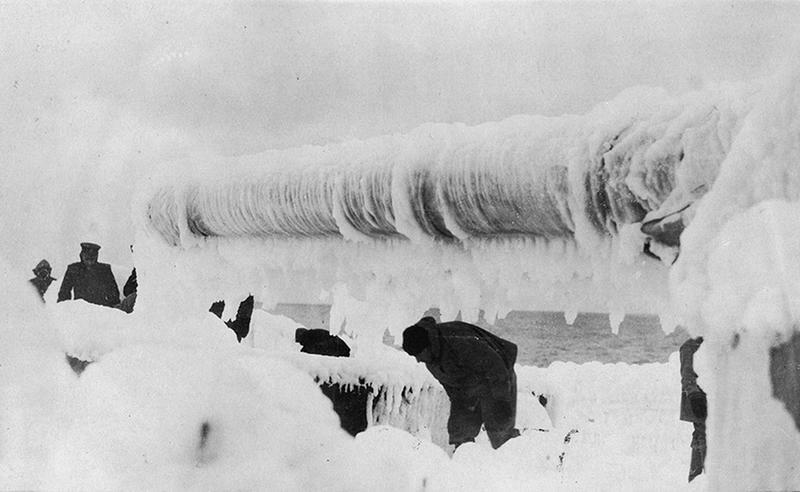 Men on deck of a ship removing ice. Original caption: "On a winters morning returning from France". 11. 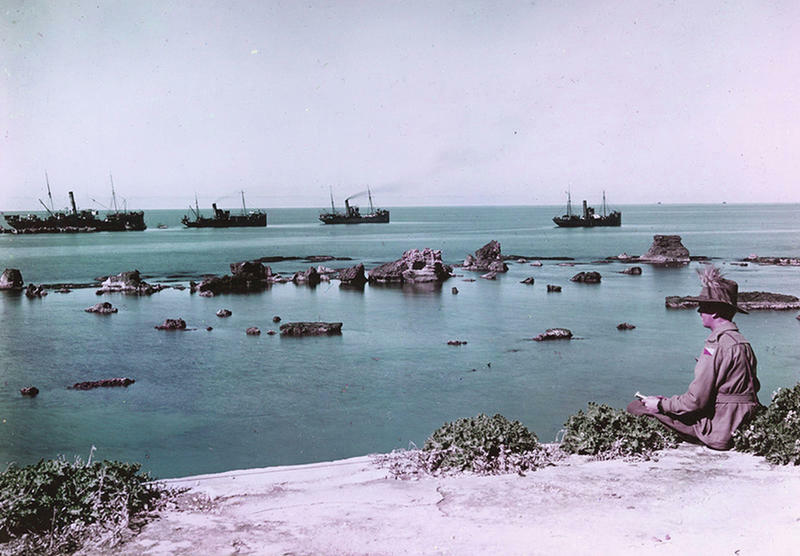 The Rocks of Andromeda, Jaffa, and transports carrying war supplies and heading out to sea in 1918. This image was taken using the Paget process, an early experimentation in color photography. 12. Landing a 155 mm gun at Sedd-el Bahr. 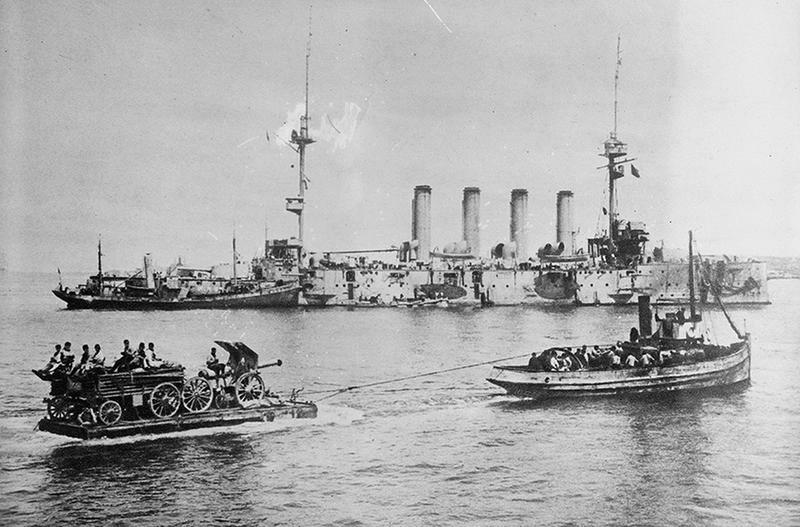 Warships near the Gallipoli Penninsula, Turkey during the Gallipoli Campaign. 13. 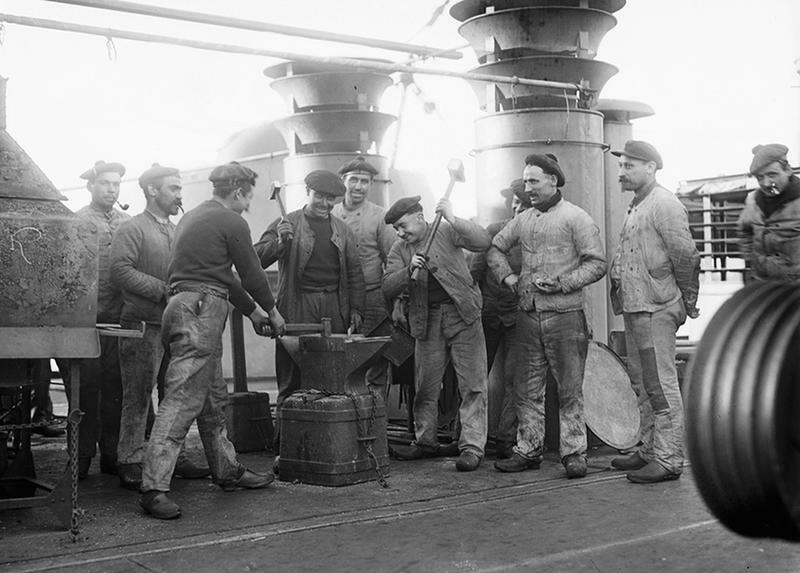 Sailors aboard the French cruiser Amiral Aube pose for a photo op at an anvil attached to the deck. 14. 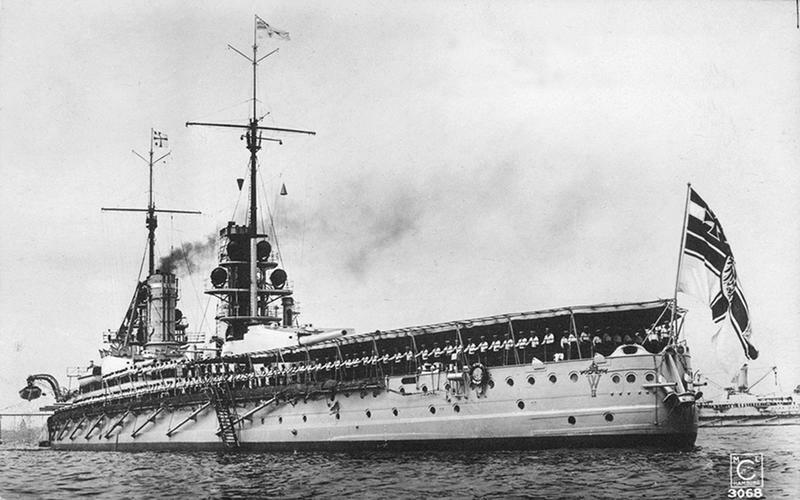 The German battleship SMS Kaiser on parade for Kaiser Wilhelm II at Kiel, Germany, circa 1911-14. 15. 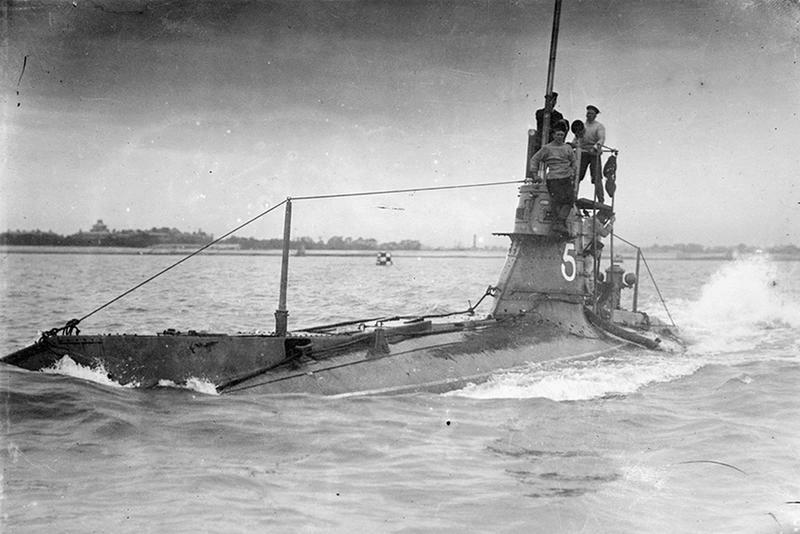 British submarine HMS A5, an A-class British submarine used in World War I for harbor defense. 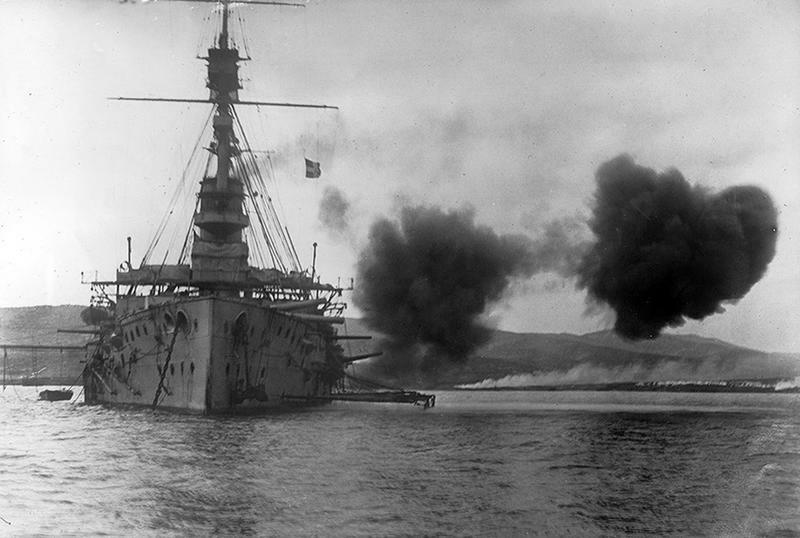 The A5, however, suffered an explosion only days after its commissioning in 1905, and did not participate in the war. 16. 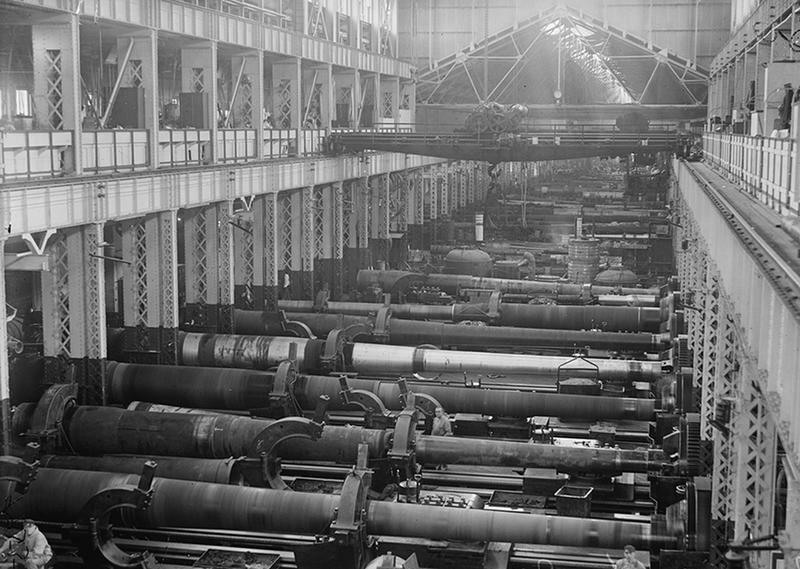 U.S. Navy Yard, Washington, D.C., the Big Gun section of the shops, 1917. 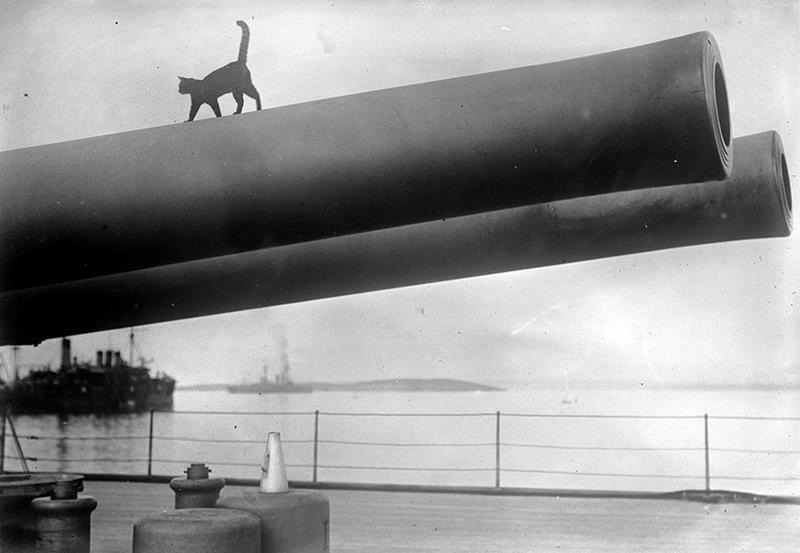 17, The cat mascot of the HMS Queen Elizabeth walking along the barrel of a 15-inch gun on deck, 1915. 18. 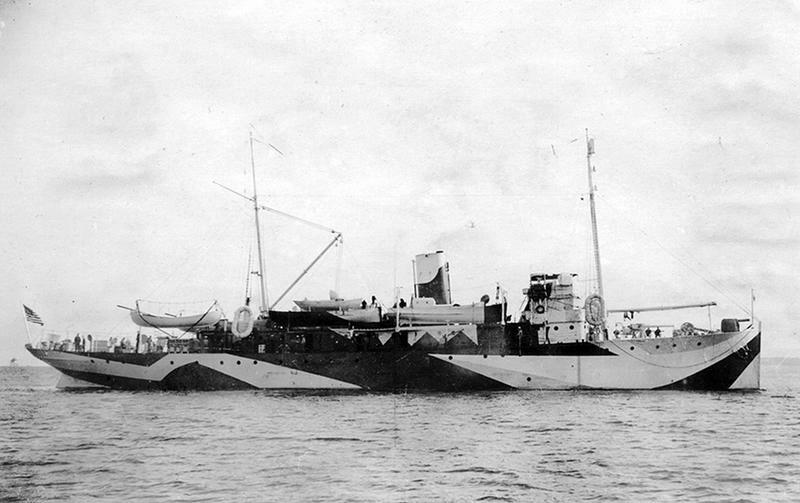 The USS Pocahontas, a U.S. Navy transport ship, painted in Dazzle camouflage, 1918. The ship was originally a German passenger liner named the Prinzess Irene docked in New York at the start of the war. She was seized by the U.S. when it entered the conflict in April 1917, and re-christened Pocahontas. 19. Last minute escape from a vessel torpedoed by a German submarine. 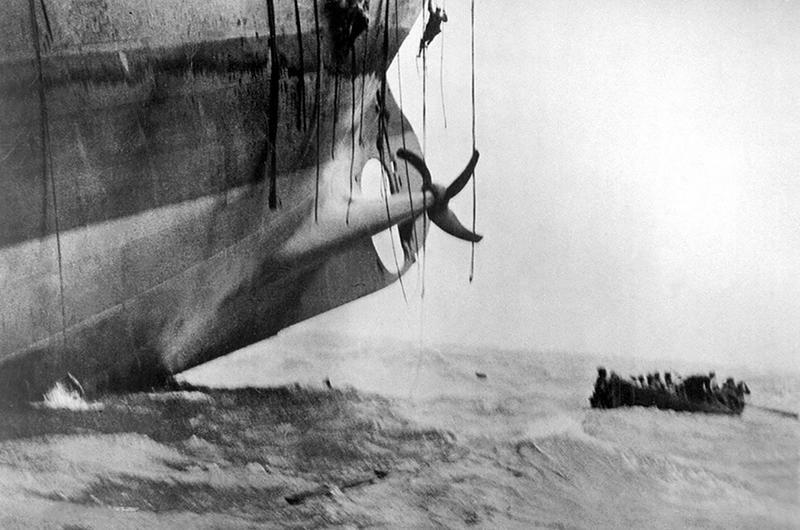 Men can be seen sliding down ropes as the last boat is pulling away, 1917. 20. 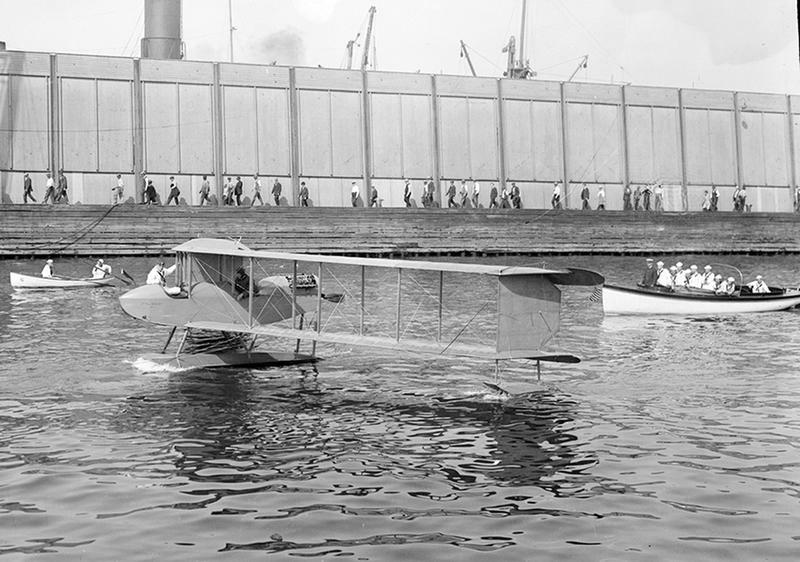 The Burgess Seaplane, a variant of the Dunne D.8, a tailless swept-wing biplane, in New York, ca 1918. 21. 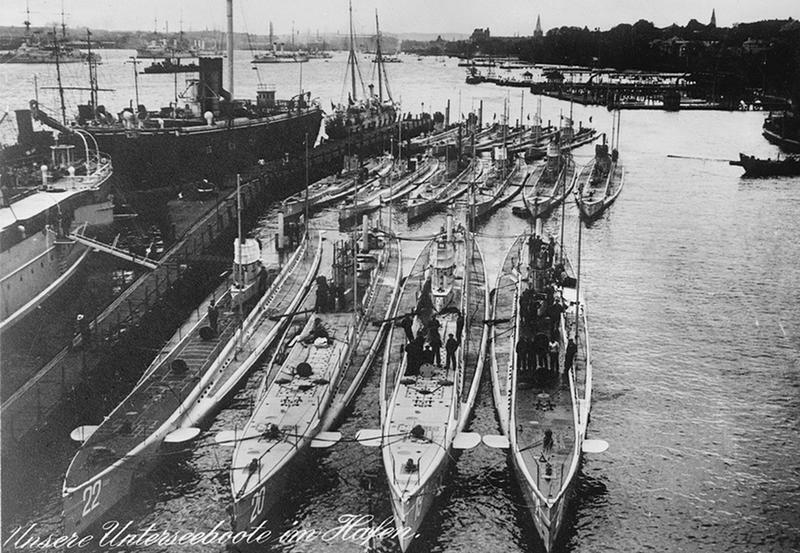 German submarines in a harbor. The caption, in German, reads "Our U-Boats in a harbor". Front row (left to right): U-22, U-20 (the sub that sank the Lusitania), U-19 and U-21. Back row (left to right): U-14, U-10 and U-12. 22. 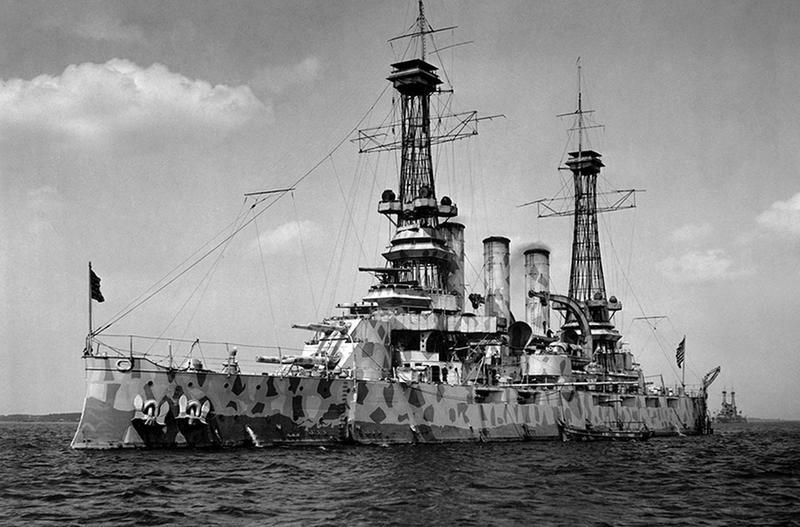 The USS New Jersey (BB-16), a Virginia-class battleship, painted in camouflage, ca 1918. 23. 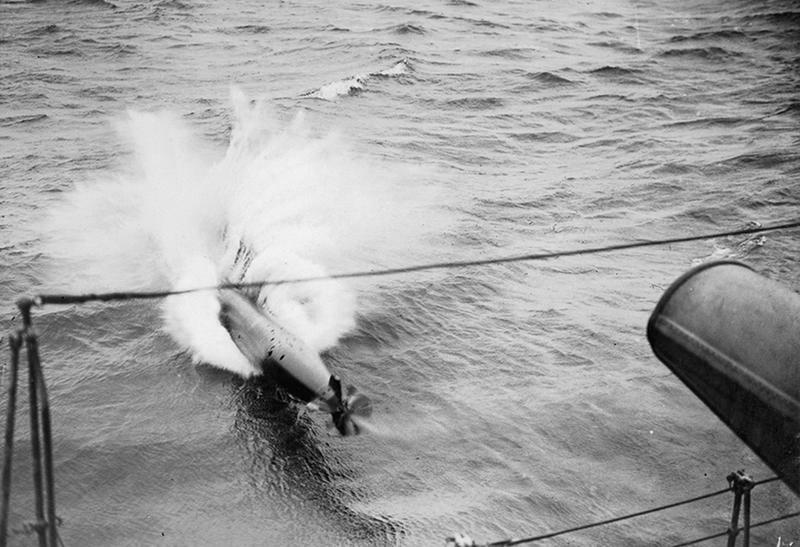 Launching a torpedo, British Royal Navy, 1917. 24. 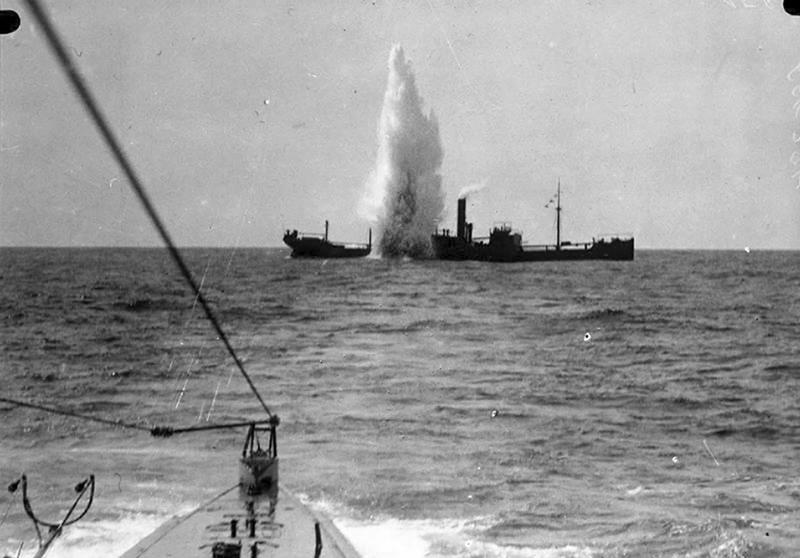 British cargo ship SS Maplewood under attack by German submarine SM U-35, 47 nautical miles/87 km southwest of Sardinia on April 7, 1917. 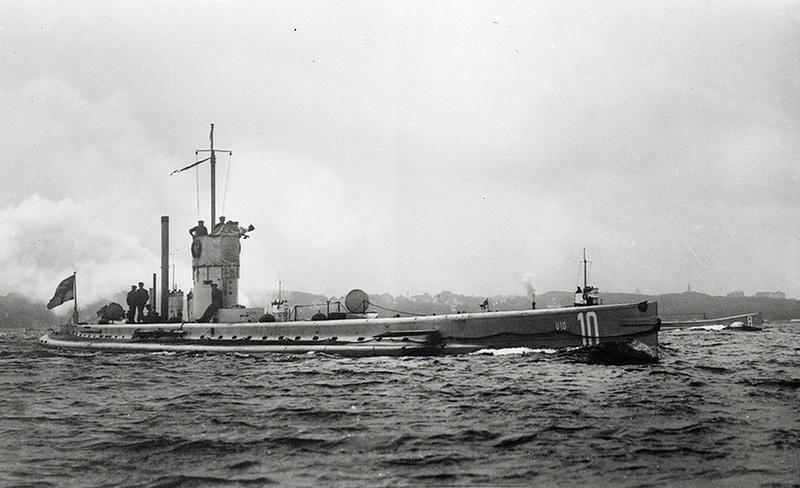 The U-35 participated in the entire war, becoming the most successful U-boat in WWI, sinking 224 ships and killing thousands. 25. 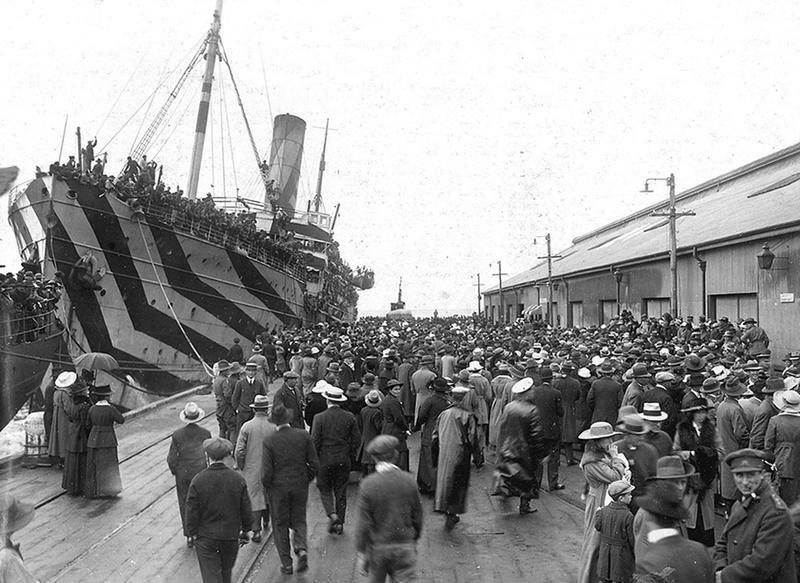 Crowds on a wharf at Outer Harbour, South Australia, welcoming men coming home from service overseas, circa 1918. 26. The German cruiser SMS Emden, beached on Cocos Island in 1914. 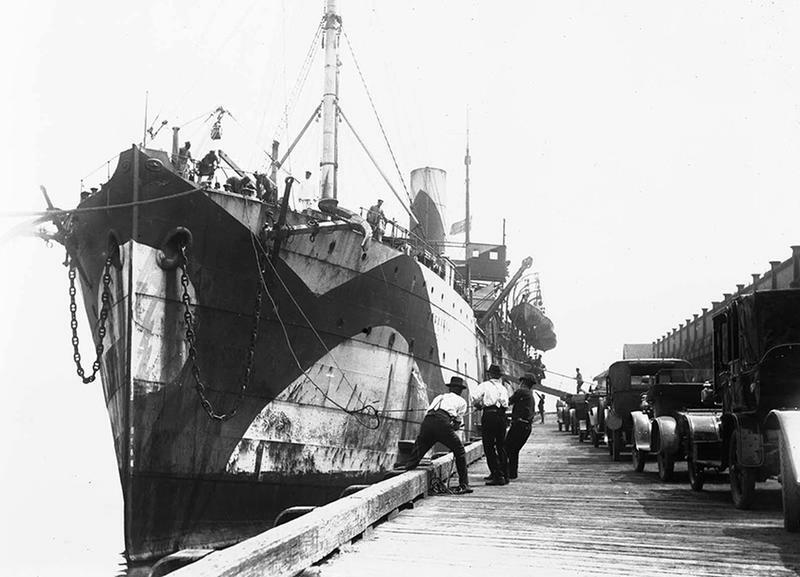 The Australian cruiser HMAS Sydney attacked and damaged the Emden, forcing it to run aground. 27. The German battle cruiser Seydlitz burns in the Battle of Jutland, May 31, 1916. 28. 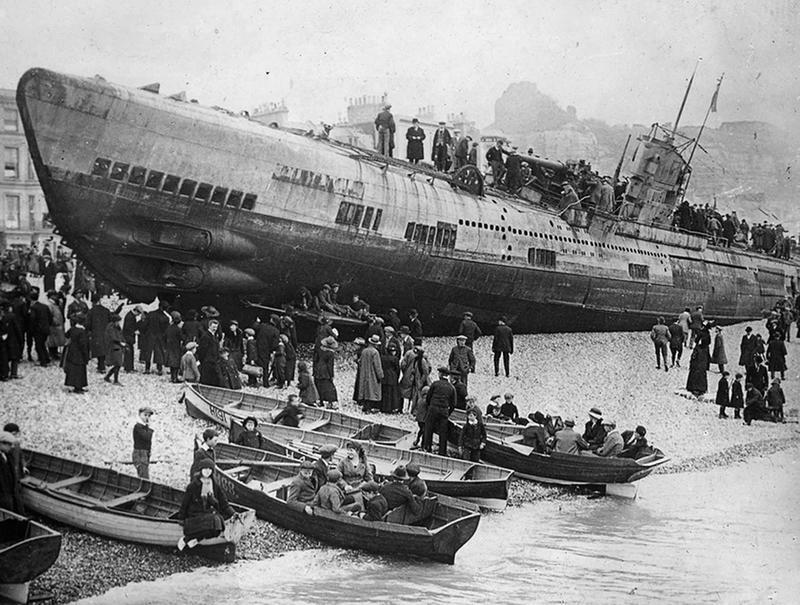 A German U-boat stranded on the South Coast of England, after surrender. 29. Surrender of the German fleet at Harwich, November 20, 1918. 30. 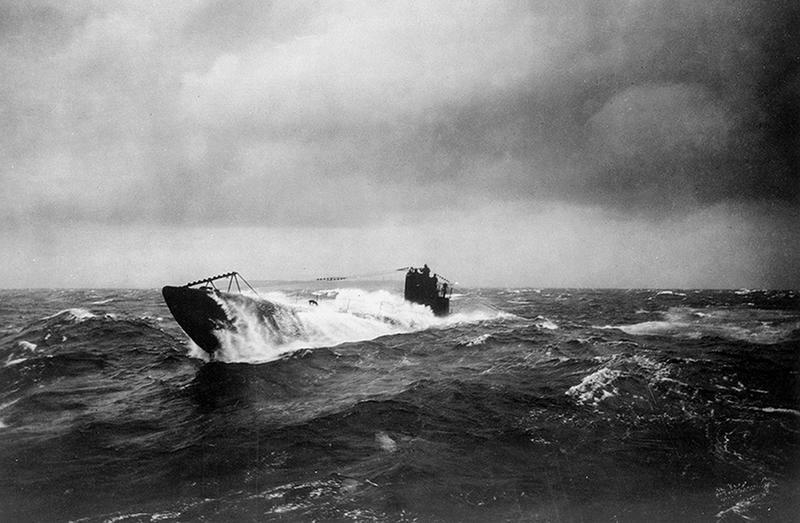 German Submarine "U-10" at full speed. 31. 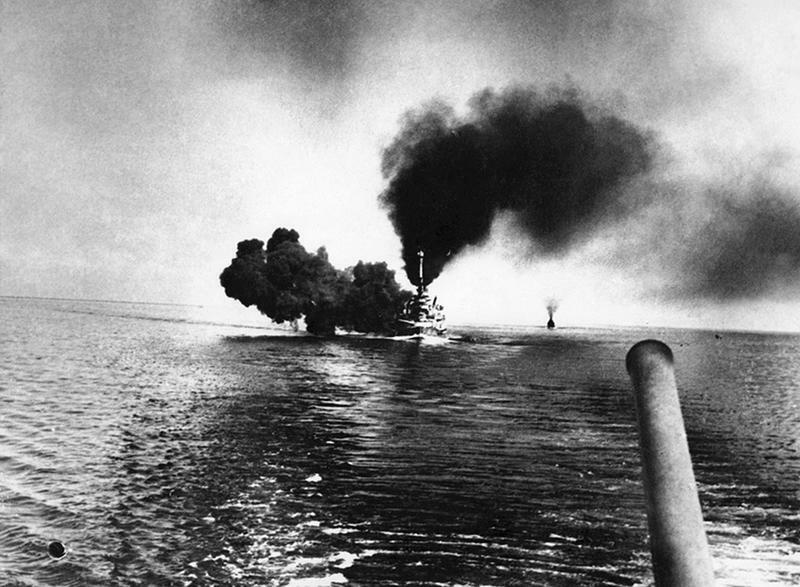 Imperial German Navy's battleship SMS Schleswig-Holstein fires a salvo during the Battle of Jutland on May 31, 1916 in the North Sea. 32. 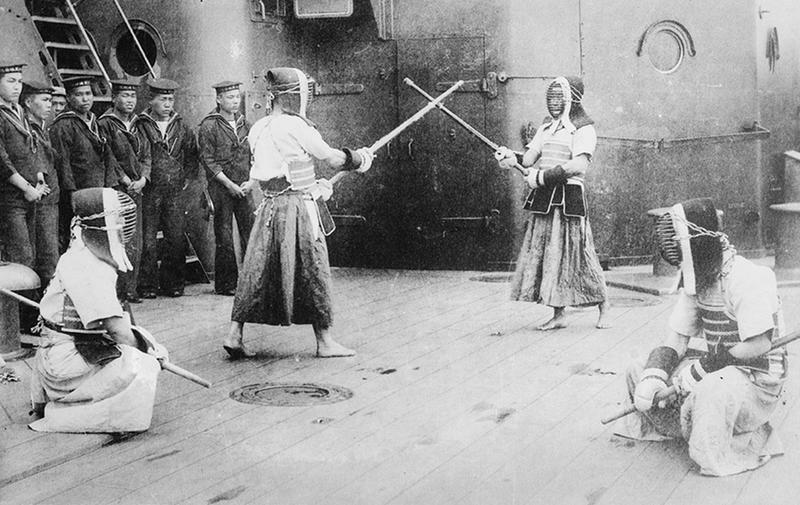 "Life in the Navy", Fencing aboard a Japanese battleship, ca 1910-15. 33. 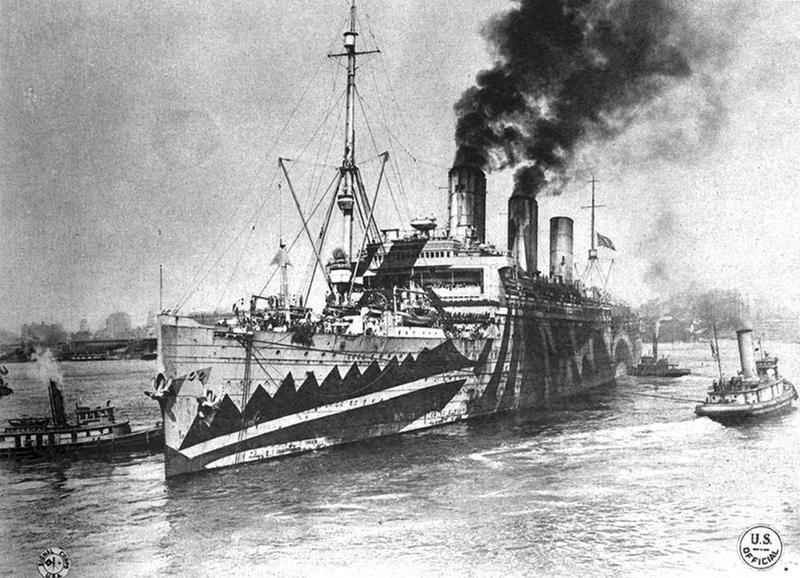 The "Leviathan", formerly the German passenger liner "Vaterland", leaving Hoboken, New Jersey, for France. In the spring and summer of 1918, Leviathan averaged 27 days for the round trip across the Atlantic, carrying 12,000 soldiers on each trip. 34. 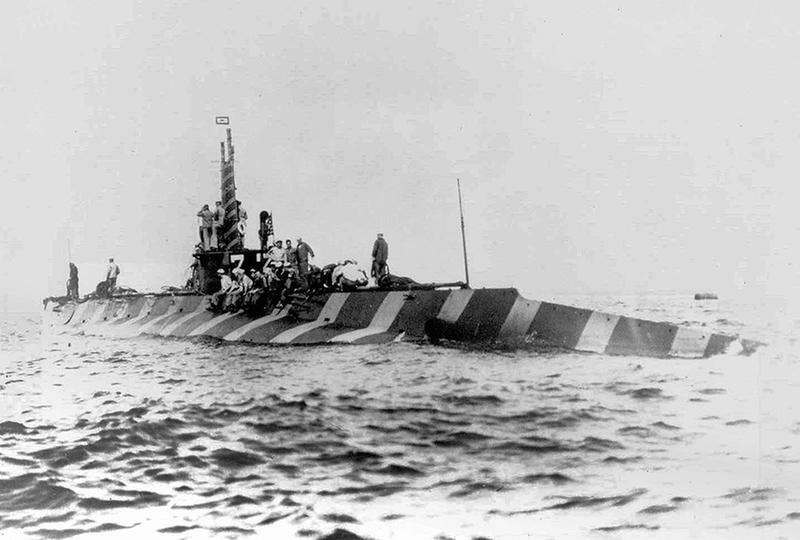 Portside view of the camouflaged K-class submarine USS K-2 (SS-33), off Pensacola, Florida, April 12, 1916. 35. The complex inner machinery of a U.S. 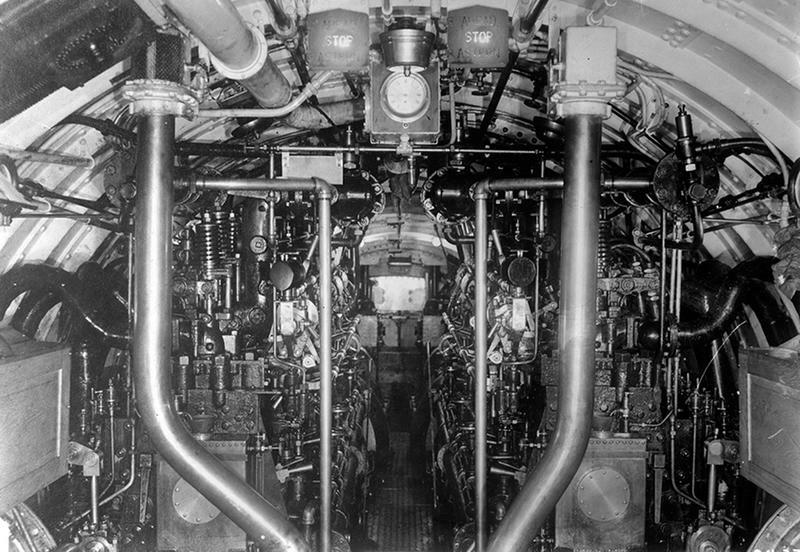 Submarine, amidships, looking aft. 36. The Zeebrugge Raid took place on April 23, 1918. In an attempt to block the Belgian port of Bruges-Zeebrugge, The Royal Navy sunk older ships in the canal entrance, to prevent German vessels from leaving port. Two ships were successfully sunk in the canal, killing 583 people. Unfortunately, the ships were sunk in the wrong place, and the canal was re-opened in days. Photo taken in May of1918. 37. 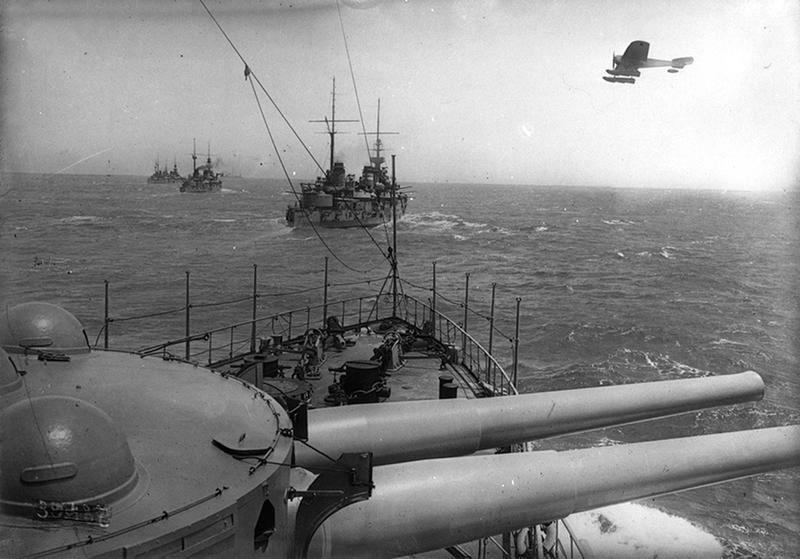 Allied warships at sea as a seaplane fly by, 1915. 38. 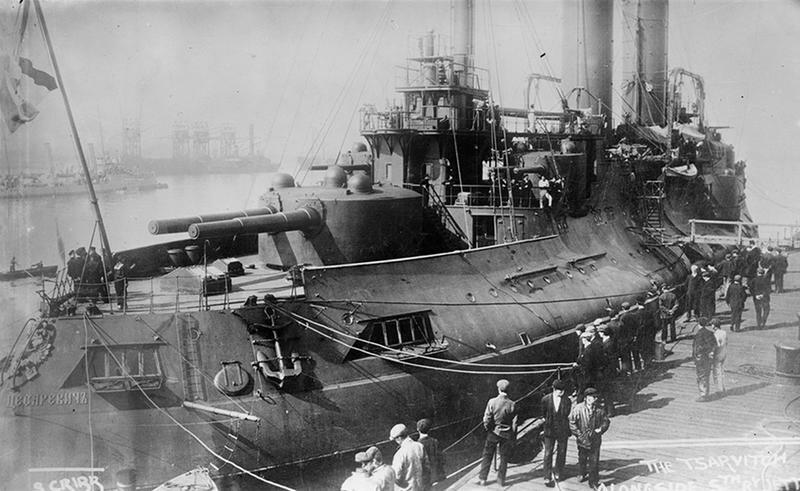 Russian battleship Tsesarevich docked, ca. 1915. 39. 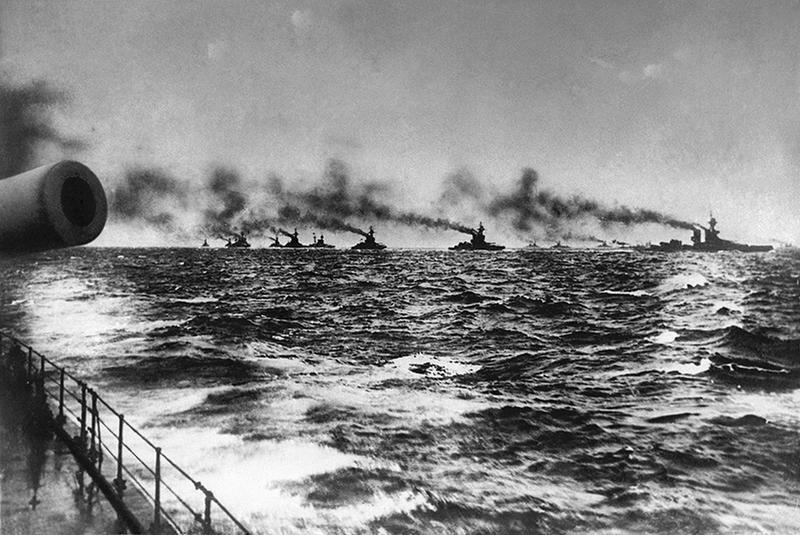 The British Grand Fleet led by admiral John Jellicoe on her way to meet the Imperial German Navy's fleet for the Battle of Jutland in the North Sea, May 31, 1916. 40. 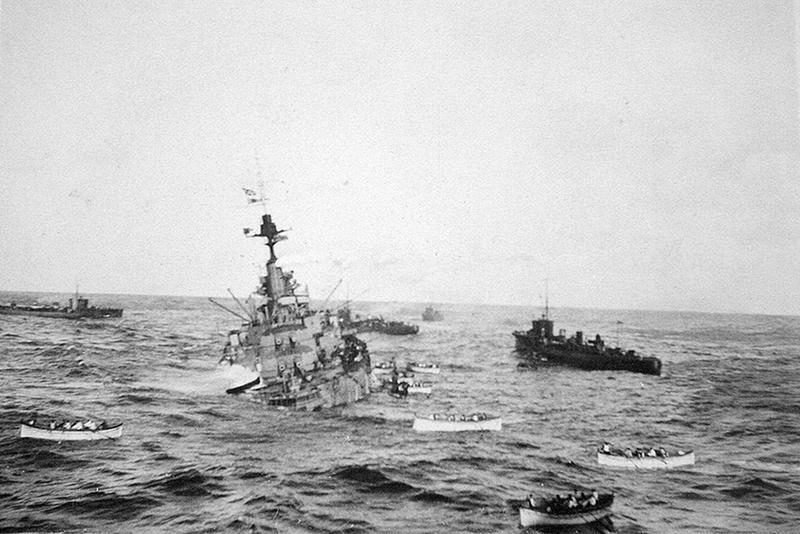 British battleship HMS Audacious crew board lifeboats to be taken aboard RMS Olympic, October, 1914. 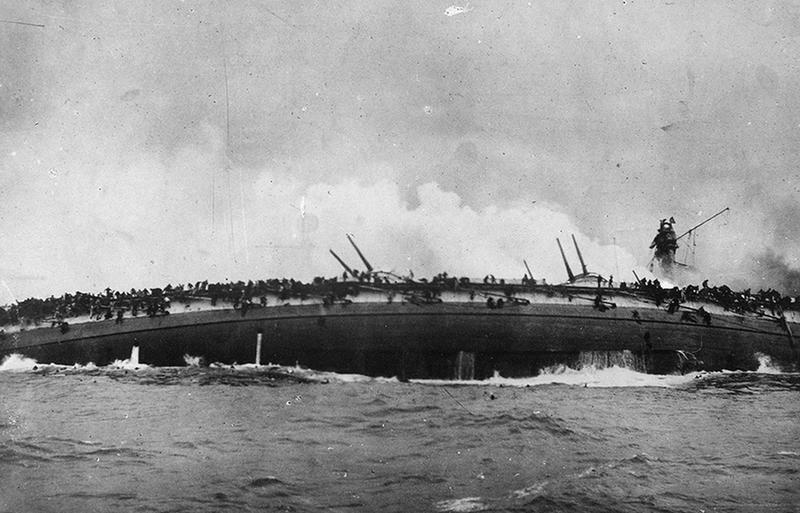 The Audacious was sunk by a German naval mine off the northern coast of Donegal, Ireland. 41. 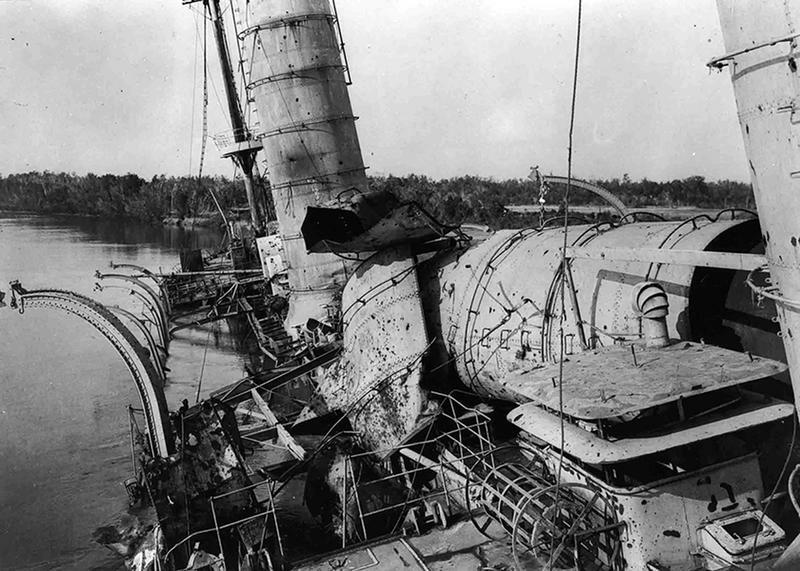 Wreck of the SMS Konigsberg, after the Battle of Rufiji Delta. 42. 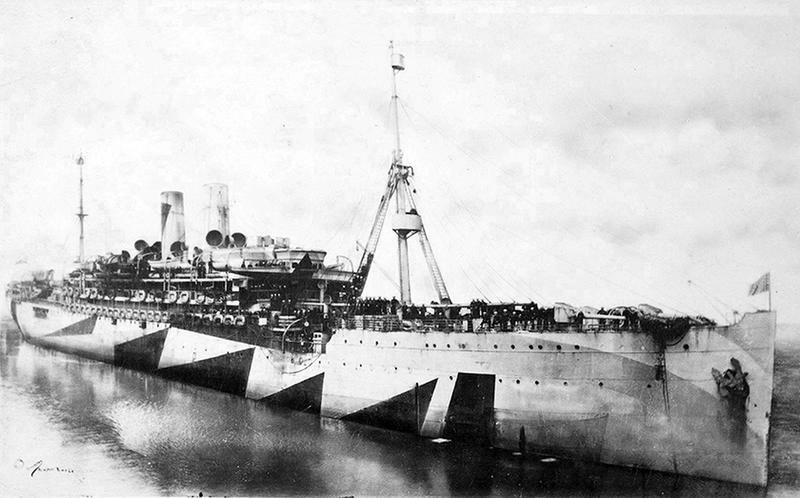 Troop transport Sardinia, painted in dazzle camouflage, at a wharf during World War I. 43. 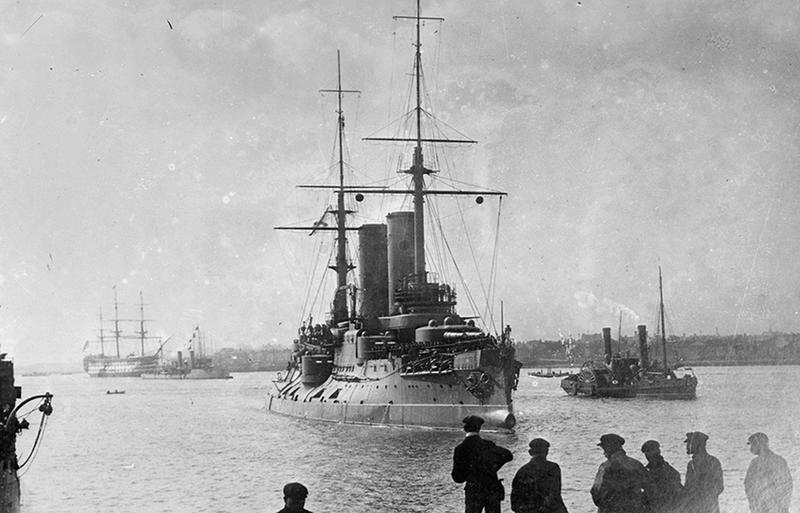 The Russian flagship TSAREVITCH passing HMS VICTORY, ca. 1915. 44. 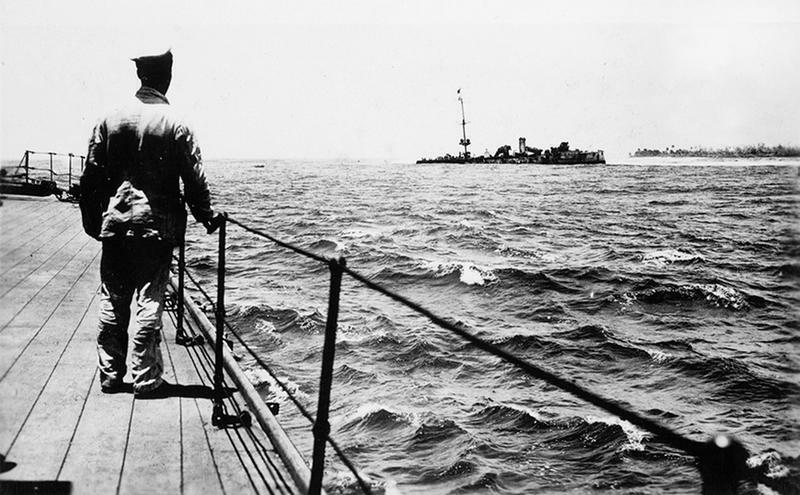 A German submarine surrendering to the US Navy. 45. 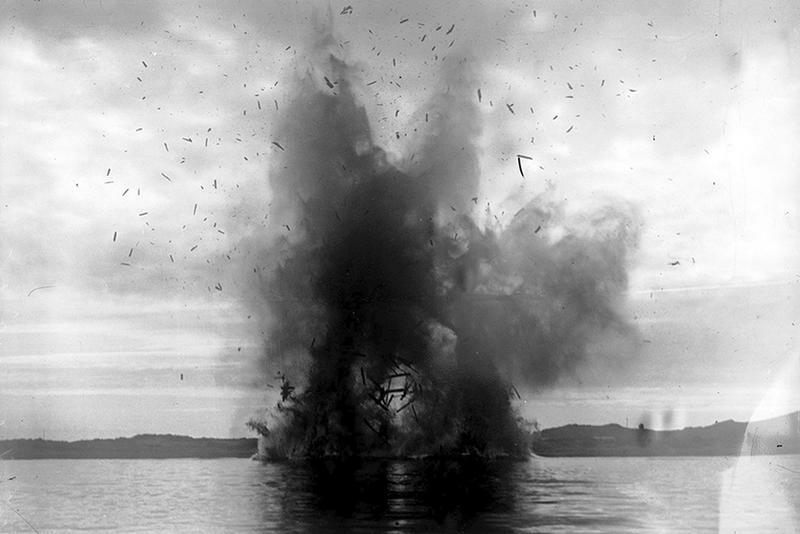 German Cruiser SMS Bluecher photographed as it sinks. An estimate of a thousand sailors sank with the ship. 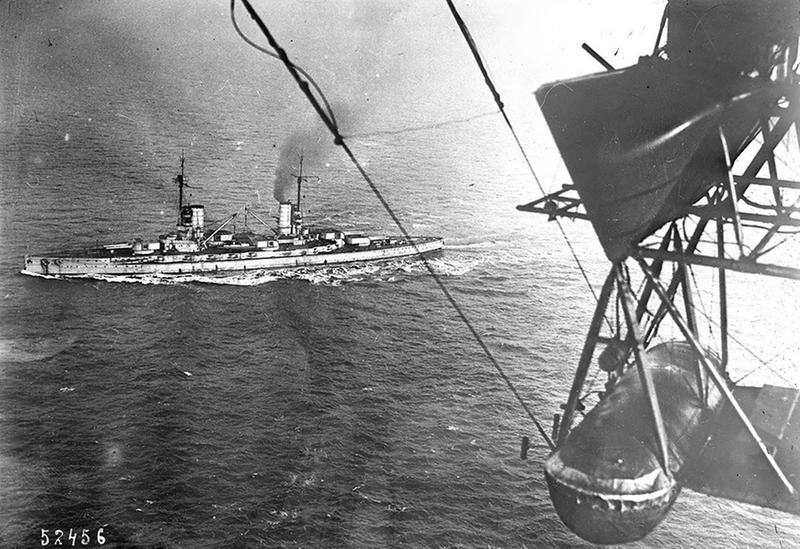 This photo was taken from the deck of the British Cruiser Arethusia on January 24, 1915.